[miau] Playtech has creating a video slot game that is a fresh look at the music industry. The game takes you back to the time where jazz ruled, and every inch of this game is simply cool in every sense of the word. Not only is the background and graphics stunning, the jazz music changes frequently during game play. 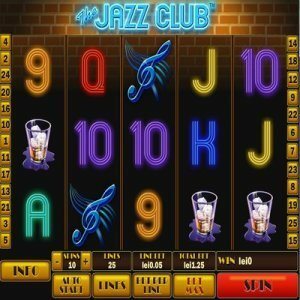 Sit back and enjoy The Jazz Club Slot game and your bankroll could really be turning up the volume in a short amount of time. During play at The Jazz Club, you care going to see quite a few symbols that are all reminiscent of being in an actual club listening to jazz music. The lower end of the symbols are all neon playing card symbols, Ace, King, Queen, Jack, Ten, and the Nine. The music symbol and glass of liquor are next up, followed by the jazz musicians. These three musicians play another important role later in the bonus round. You have the piano player, the trumpet player, and the bass player. The music during play is really laid back, and each time you press the spin button it changes. The microphone is the wild symbol, and it substitutes for all other symbols in a winning payline except for the Jazz Club scatter symbol. The Jazz Club scatter symbols are where all the real fun begins. If you are lucky enough to gather at least three scatters on the reels, you will be taken behind the curtain at the Jazz Club to where all the action is taking place. Once you enter the bonus round, it is actually two bonus games in one. Once you are taken backstage of the Jazz Club, you are going to be asked to choose from three separate free spin features. If you choose the trumpet player, you are instantly awarded 14 free spins. Choose the bass player, you receive 10 free spins at a 2x multiplier. Finally, choose the piano player and you get 7 free spins at a 4x multiplier. This feature can not be retriggered, but that is not where this bonus round ends. While the free spins are playing out, you will also benefit from what is called the expanding wild. Unlike other slot games and true to the Jazz Club, if the wild microphone appears on a winning payline, it will expand and turn into a sultry brunette Jazz Club singer who springs to life on the reels. She seems to come right of the screen and begins belting out a classic song right inline with all the rest of the music in this compelling online video slot game. The 5 reel and 25 line Jazz Club is one of those slot games that you will instantly connect with. Grab a drink, hit the autoplay feature, and allow the Jazz Club to rock and roll your bankroll.